Equitable access to opportunities for safe and convenient places to be active, as well as transportation systems that encourage daily activity are important components of chronic disease prevention. This working group explored existing and emerging opportunities to address issues like complete streets, active design, and preserving park land in our communities. Complete Streets is an evidence-based strategy for improving bike and pedestrian accommodations in communities, making streets safer and encouraging greater physical activity which can lower rates of obesity and chronic disease. Complete Streets policies require that transportation planners and engineers consistently plan, design, and build roadways with all users in mind—including bicyclists, public transportation vehicles, and pedestrians of all ages and abilities. Complete Streets allow all users of the road to travel safely. The New York State Prevention Agenda has identified Complete Streets as a priority strategy for preventing chronic disease. 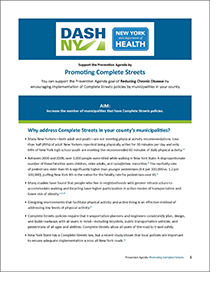 The DASH-NY Complete Streets fact sheet can be used as a tool to support the development and implementation of local Community Health Improvement Plans and Community Service Plans. The Complete Streets Webinar #1: Moving into Action: Planning & Implementing Complete Streets introduces participants to thinking about aspects of planning and implementing Complete Streets policies and projects. The Complete Streets Webinar #2: Getting Investment: How to Identify and Secure Funding for Complete Streets Projects features tips on how to how to prepare and secure transportation funds to support Complete Streets projects. 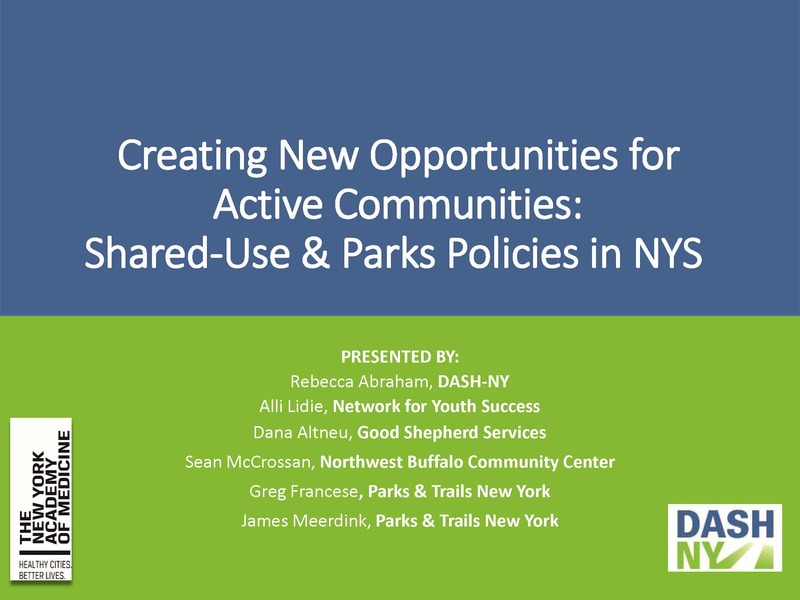 DASH-NY created a Slide presentation: Creating New Opportunities for Active Communities: Shared-Use & Parks Policies in New York State to educate stakeholders about how to expand access to parks, trails, and outdoor recreation statewide through increased funding and the creation of statewide policies to allow shared use of school facilities. 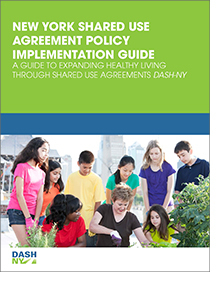 New York State Shared Use Agreement Policy Implementation Guide is an informational resource for community members, local stakeholders such as parks and school officials, parents, teachers, and public health advocates interested in improving opportunities for healthy living by implementing shared use agreements across New York State. The physical surroundings where people live, work, learn, and play can impact our decisions to be active. The Active Design Guidelines were created through a collaboration of NYC agencies, researchers, planners, and architects to show how changes to the built environment can increase physical activity. Active Design is crucial in tackling obesity and obesity related diseases by promoting physical activity and health eating within offices and public facilities. Hosted by DASH-NY, the Strategies to Implement Active Designs into Local Jurisdiction Projects Webinar is geared toward representatives from local and state government agencies, professional planners and architects, community-based organizations, and others interested in learning about effective strategies to promote the integration of Active Design Guidelines into public sector projects through RFPs, contracts, and professional standards. Hosted by DASH-NY, the Active Transportation Technical Assistance Interactive Webinar provides a background on the principles of active transportation, specifically how the built environment can encourage or discourage active modes of transportation like walking and biking. Other topics covered include how to conduct outreach around active transportation projects, how transportation systems can be enhanced, and land use design strategies. The webinar also provides “lighter, quicker, cheaper” strategies to get active transportation projects of the ground with minimal resources.